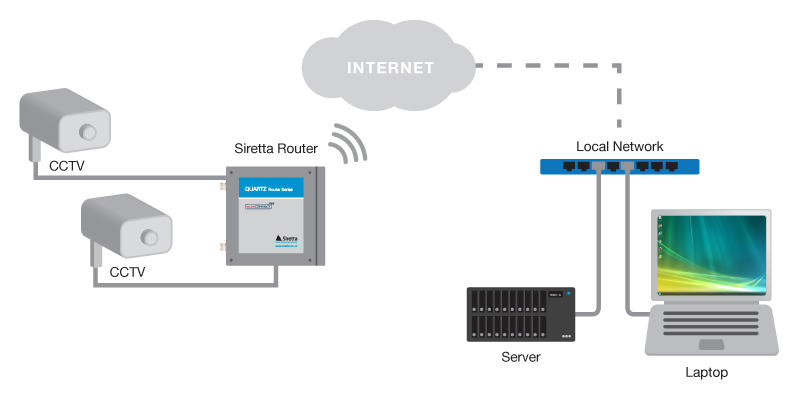 Siretta routeCONNECT solutions are used in remote CCTV security systems to allow standard Ethernet enabled CCTV cameras to transmit their video stream over the internet to a central location. Many CCTV systems are designed to connect to broadband internet via a wired Ethernet connection or in more recent designs over WIFI. The routeCONNECT solution will accept CCTV video stream from either wired Ethernet or via WIFI and stream the video channel securely over 3G/UMTS and 4G/LTE cellular networks. The Siretta routeCONNECT solution enables remote access to CCTV equipment using cellular network and enables equipment to communicate over the web which was not designed to be internet enabled. This allows you to network enable equipment in the field and reuse existing equipment which would otherwise have to be upgraded to a more advanced version.